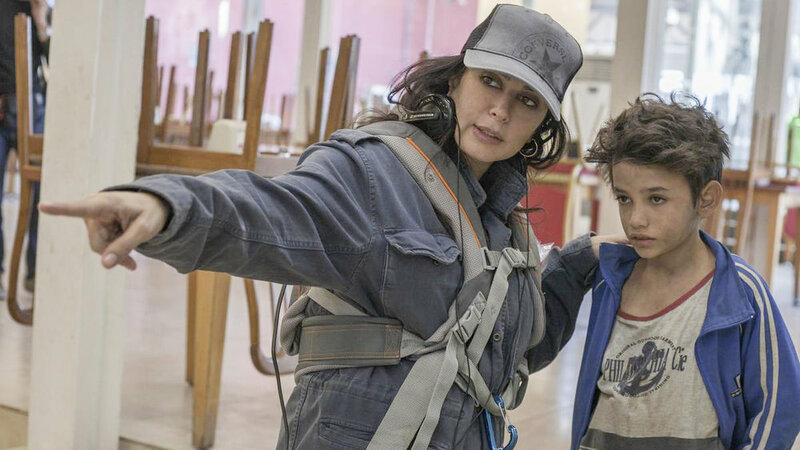 Two months ago, Nadine Labaki made history in multiple ways when her film 'Capernaüm' received a fifteen-minute standing ovation at Cannes. Nadine Labaki might be garnering new visibility with her critically-hailed neorealist drama, but at forty-four years old, the Lebanese music video and feature film director has already established a reputation with her feature films, Caramel and Where Do We Go Now?, which debuted at Cannes and then went on to a significant amount of commercial success and numerous awards. As increased thought is being given to the treatment of women in the film and television industry, the Artistic Director of Cannes Thierry Fremaux was in the hot seat in the lead-up to the festival for only accepting three female-directed movies into the competition for the Palme d’Or (the festival’s most prestigious prize), where there were a total of twenty-one films in the running. Nadine Labaki was one of these exceptional three female filmmakers, along with French director Eva Husson and Italian director Alice Rohrwacher. Even as this year’s Cannes jury featured a slight majority of women (notably led by Cate Blanchett), and the Un Certain Regard and Director’s Fortnight divisions showcase a more extensive variety of work, the Palme d’Or is still a dicey prospect for women. Women have directed only 18 of the 180 films nominated for the Palme d'Or in the last ten years and only one woman, Jane Campion, has ever taken home the top prize in the festival’s 72-year history. Even before getting to the astounding critical reception, Labaki’s having a presence in the competition is a feat in itself. After the showing, Capernaüm instantly sparked speculation as being the sure-fire bet to win the festival’s top prize. While the Palme d’Or ultimately went to Hirokazu Kore-Eda’s film Shoplifters, Labaki has walked away with the Jury Prize and fired-up interest in her work. Immense preparation has brought Labaki to this point. When she was 16, she started directing music videos for a local talent show and then went on to study media and directing in college, even winning an award for her thesis. (A few years) After college, she took some acting training at the Cours Florent in Paris (which has also trained performers like Mylène Farmer, Gad Elmaleh, and Audrey Tautou) and she branched out into acting. Ultimately though, directing was her foundation, and she continued to work on music videos, commercials, short films and public service announcements along with taking on acting roles. Simultaneously, while becoming more widely known for her music videos, she was also accepted into the Cannes Film Festival Residence during which she wrote Caramel, her first feature. Director and star Nadine Labaki on the set of Caramel. While Labaki’s upbringing was shaped by the Lebanese Civil War, which spanned much of her childhood, her work is notable for bringing dimension to its treatment of conflict and cultural identity. Caramel is a widely loved rom-com about the sisterhood between friends who get together to talk about their relationship problems in the beauty shop where three of them work. The movie made more than 14 million dollars and is the most widely distributed Lebanese film to date. It also spawned breakout Yasmine Al Massri, who currently stars on ABC’s Quantico. Labaki’s sophomore follow-up Where Do We Go Now?, showcased the director’s ability to direct a heavier drama and set her up for her work onCapernaüm. Capernaüm puts the issue of Lebanese conflict front and center as it follows a boy named Zain as he sues his parents for neglect. Labaki draws on the filmmaking tradition of social realism and relies on a cast entirely made up of non-professional actors to depict situations based on their real lives. Capernaüm will be a must-see when it has its wide release in December and will likely be in the running for Best Foreign Language Film for next year’s Oscars. Her Cannes reception might have been a peak in her career, but it’s hardly the culmination. Labaki, having worked primarily out of Beirut and Paris up until now, has just signed a contract with the Creative Artist’s Agency, based out of L.A., where she’ll likely be able to find a new audience. Can't take a compliment? Me neither.